This entry was posted in Word 365 ProPlus English and tagged Advanced Properties, Author, Comments, Contents, Created, Custom, Fields, Info, Last Modified, Last Printed, Microsoft Office 365, Microsoft Word 365, Office Smart, Office System, Open File Locations, Page, Properties, Properties Fields, Related People, See More Document Properties, Size, Smart Office, Statistics, Subscribe, Summary, Tags, Title, Total Editing Time, View, View Or Change The Properties For An Office File, Words, YouTube Channel. First of all we must select the Calendar necessary and then we must select the Home tab of the Calendar screen, and then from the right area of the ribbon we must locate the area Share as shown below. Once we have located the Share area of the ribbon, we select the command Calendar Permission where we can: View And Edit The Sharing Permission For This Folder. 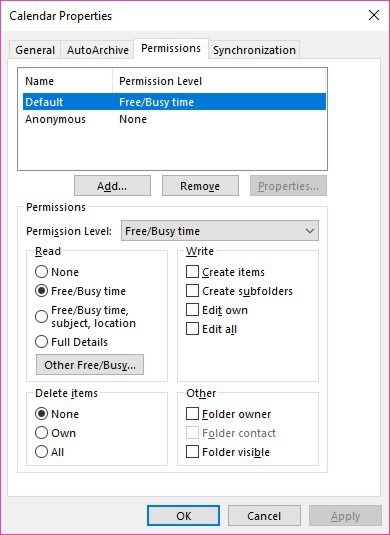 Once the Calendar Permissions command is selected the Calendar Properties dialog box appears as shown below. This dialog box is separated by four different tabs which are General, AutoArchive, Permissions and Synchronization. The tab that is activated is the Permissions one. 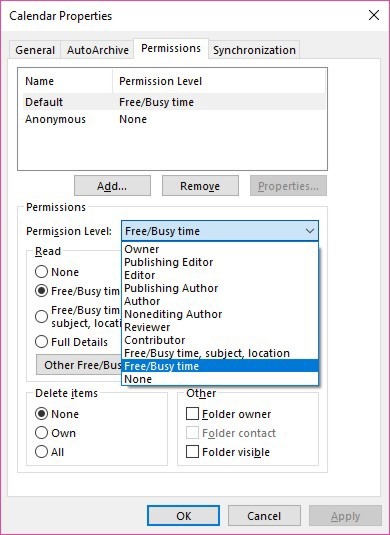 Below the above area we can use the Add, Rename and Properties buttons, in order to Add a Name, change a Permission and change the Properties. All we need to do, is to select a Permission Level from the drop-down menu for it to change. At the right of the Read area, we have the Write area where we can activate or deactivate the check box of one of the following commands. 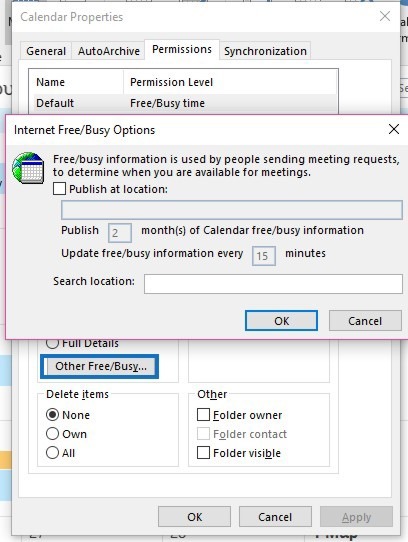 We also have available the Other Free/Busy button, where if we select it, the Internet Free/Busy Options dialog box appears, where Free/Busy Information is Used By People Sending Meeting Requests, To Determine When Your Are Available For Meetings. We do the adjustments that we need and then we press the Ok button to return to the Calendar Properties dialog box. At the bottom of the Calendar Properties dialog box, we have the areas Delete Items and Other, where we can activate the following check boxes. Whatever changes we make, we must press the Ok button at the bottom of the Calendar Properties dialog box, in order to return to our Calendar and for the adjustments to take place. 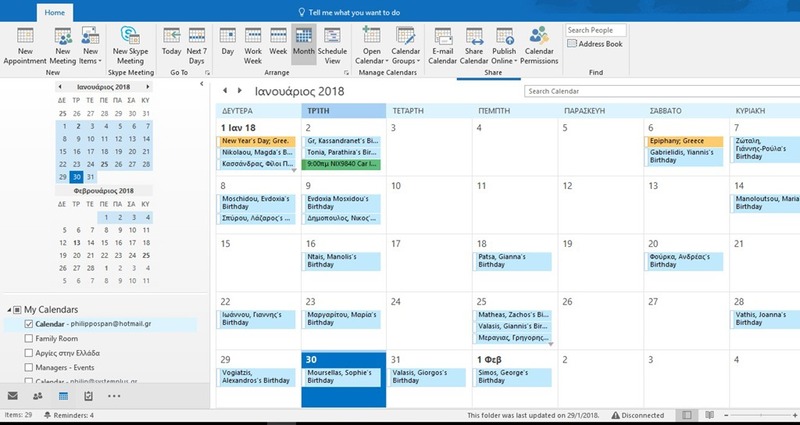 Below you can check out the video describing how to Change The Calendar Permissions in Outlook 365. This entry was posted in Word 365 ProPlus English and tagged Add, Author, AutoArchive, Calendar Properties, Contributor, Create Items, Create Subfolders, Edit All, Edit Own, Editor, Free/Busy Time, General, How To Set Calendar Permissions in Outlook 365, Location, Microsoft Office, Microsoft Outlook, Office Smart, Office System, Owner, Permission Level, Permissions, Publishing Editor, Rename, Reviewer, Smart Office, Subject, Subscribe, Synchronization, View And Edit The Sharing Permission For This Folder, YouTube Channel.